Recent years, plastic injection industry have a huge change in the environment of consumption upgrade. product requirements are getting an increase. In the past, large-scale production of precision-less plastic industry, now also need to rely on the mold industry to improve the accuracy of product demand. The production of plastic products starts with the design and development of plastic molds, which are a basic tool for manufacturing of plastic products. As a result, the mold precision has a direct influence on the structural integrity and dimensional accuracy of the end plastic products. The production of all plastic products has to go through the several steps that include design & making of plastic molds, injection molding, and surface finishing, among which the precision mold features a complex structure and therefore imposes high requirements for surface quality and technical standards. Since it is a technology-intensive as well as capital-intensive product, many technologies need to be involved in its production process, including high-speed machining, super-finishing, rapid prototyping, automatic control, processing and applications of polymeric materials, etc., covering the areas of machinery, metal materials, polymeric materials, electronics & electrics and automatic control, imposing high comprehensive requirements on technologies. Plastics are malleable (seldom non-malleable) material that are consisting of synthetic or natural high molecular compounds. They are produced under certain temperature and pressure conditions, assisted with additives of plasticizer, filler, lubricant, injection agent and more. Plastics are widely used in modern society thanks to its lightweight, high plasticity, low production cost and diversified functions. Currently, as one of the four basic materials that support the development of modern society (the other three are steel, wood, and cement), the high molecular compound material has become a new material that is indispensable to human life. Its application covers the many areas of information, energy, industry, agriculture, and transportation, etc. In recent years, the plastic manufacturing industry of China has witnessed a rapid development with an ever-increasing scale – it is now one of the essential parts of the Chinese economy. Therefore, it is obvious that the production scale of the Chinese plastic manufacturing industry is being continuously expanded and production is increasing year by year, though year-on-year increase rate slows down a little bit over the past two years. If viewed from the different segments of the plastic manufacturing industry, the most widely used plastic products are plastic pipes & fittings, plastic wires, and plastic weaving products, followed by plastic films and plastic packaging containers, while household plastic products and plastic parts rank third. from 2012 to 2014, though increase rate slowed down slightly, the prime operating revenue was still on the rise, which hit 939.413 billion CNY as of 2014. As an intermediate product used for the production of the end product, molds are basic processing equipment that is machined by using a wide range of materials, such as plastic, rubber, metal, powder, glass, and FRP, etc. Mold processing is one of the most important ways of material molding. Compared with machining, its benefits include fewer process steps, higher material utilization ratio, less energy consumption, ease of production, higher profitability and more. Thus, it is widely used in the manufacturing of automobile, energy, machinery, electronics, information, aviation, as well as household commodities. According to statistics, 75% parts of the rough processing industry and 50% parts of the precision processing industry are molded, while 80% parts of the home appliance industry and over 70% parts of the ME industry are also mold-processed. As the mold industry is helpful for driving the development of other related industries, it is often dubbed the profit amplifier. Though the mold industry of China had an early start, it was kept as an affiliate of downstream production-oriented enterprises, which restricted the development of molding enterprises, and molds were not listed in the ME product catalog until the year of 1987. At that time, there were approx. 6,000 mold factories in China, which yielded a total production value of 3 billion CNY. After more than two decades of development, the Chinese mold industry has made a remarkable progress. As of 2013, the number of mold companies had reached 30,000, with a total output value of approx. 220 billion CNY and an annual export value of nearly 5 billion CNY. Currently, the largest markets of Chinese molding lie in the following industries of automobile, IT, home appliance & office equipment, machinery and building materials. Along with the rapid growth of national economy and improvement of people’s income level, there is a growing demand for automobiles, consumer electronics, and home appliances, allowing these industries to embrace a speedy development phase in recent years. This constitutes one of the most important reasons for the rapid development of China’s mold industry. The following diagram shows the 2007 – 2013 mold production value of China. 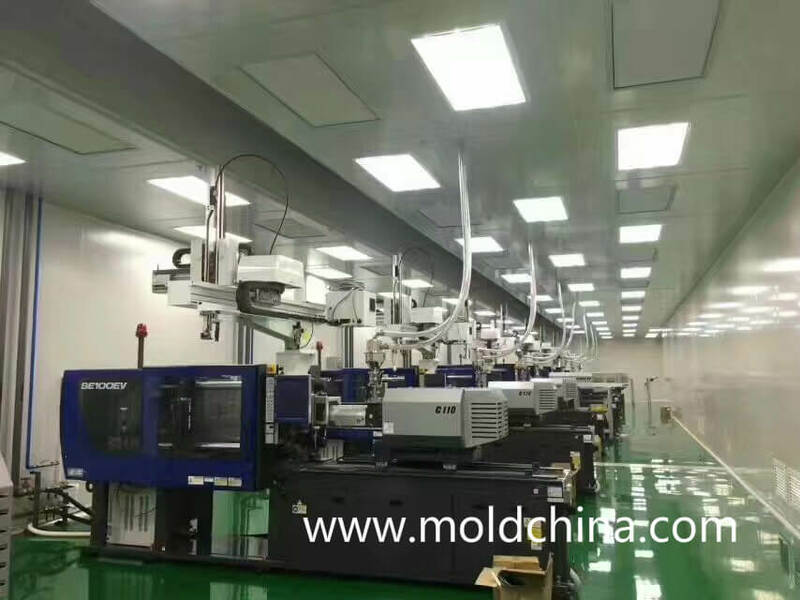 We can see that the production value of China’s mold industry has witnessed a rapid growth in recent years, increasing from 87 billion CNY in 2007 to 210.6 billion CNY in 2013, with an increased rate much higher than the overall level of the world mold industry. Along with the gradual industrial transformation and upgrade, as well as the increasing proportion of high-end products and continuous improvement of basic supporting services, there’s still much value in plastic production. Though it is witnessing a slower increase rate of production, the output value is still increasing at a relatively fast pace. We can tell that the plastic processing industry still shows a sign of rising. As one of the indicators to measure the development level of a country’s plastic industry, the ratio between plastic and metal is only 30:70 in China, falling far behind the world average (50:50) and the developed countries like Germany (63:37) and America (70:30). Hence, with technological advancement and consumption upgrade, the plastic industry of China will maintain a steady development pace. The mold industry which forms a basic industry in the national economy, is specifically involved in machinery, automobile, optical industry, electronics, chemistry, metallurgy, building materials and more industries, representing a very wide and comprehensive scope of application. China’s industry is developing rapidly, among which, the development of automotive manufacturing, IT and the medical device offers a great development opportunity for the entire mold industry. Currently, China is experiencing an industrial restructuring, with national objectives for emerging industries planned as: by the year of 2020, the increased value of strategic emerging industries is aimed to account for about 15% of GDP. To achieve this 15% target, among all the seven strategic emerging industries, as the pillar of national economy, the high-end equipment manufacturing industry will be vigorously developed, so the mold industry which is dubbed “the mother of modern industry”, will definitely benefit from the development of high-end equipment manufacturing.